Bright ruby red in color, with a gorgeous mix of strawberry and blackberry jam, the delivery of delicious fruit is never ending. The sweet cherry and vanilla flavors are ridiculously smooth and fresh as they glide across your palate. All the rich fruit carries into the finish with silky tannin and beautiful hints of cranberry and potpourri. There are few late harvest reds of this caliber making this a fantastic wine to discover and share. It’s been forever since we’ve sourced a late harvest red from Romania but we’ve got our hands on one now and it’s amazing! 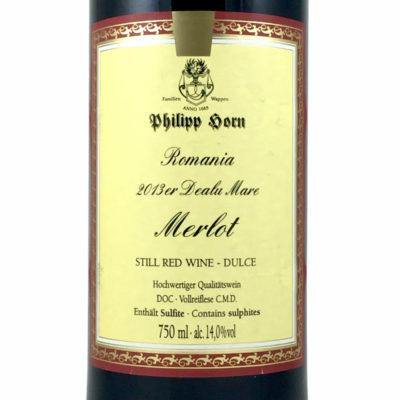 The 2013 Phillip Horn late harvest Merlot is an early Christmas gift for sweet red wine lovers and it’s here at the perfect time, just before the summer heat kicks in. The wine is amazing in every way, the bright ruby color glows in the glass like a jewel. On the nose there’s a gorgeous mix of strawberry and blackberry jam with hints of walnut and clove. It will tantalize your tastebuds, the sweet cherry and vanilla flavors make you want to pull a crazy straw and drink straight out of the bottle, especially if you give it a slight chill. All the sweet fruit carries into the finish with silky tannin and beautiful hints of cranberry and potpourri. It’s so great to have this wine back after so long, no matter how you drink it you’re going to love it.